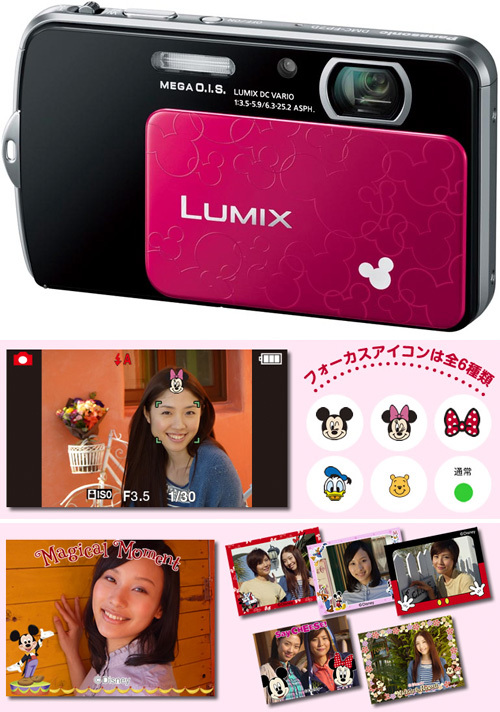 Panasonic's New Disney Themed LUMIX DMC-FP7D | OhGizmo! By Andrew Liszewski on 05/25/11 • Leave a comment! Finally realizing that consumer demand isn’t that important, and that people were probably tired of hearing about new ereaders, yesterday Panasonic announced a special Disney-themed edition of their Lumix DMC-FP7 P&S digital camera. Besides sporting Mickey Mouse graphics and patterns on the sliding lens door, the camera’s UI has also been ‘enhanced’ with Disney characters. And using the 3.5-inch touch friendly LCD display shutterbugs can even muck up their photos with Disney character themed icons, phrases and even fancy borders. The ‘D’ version of the Lumix DMC-FP7 will be available starting June 10th, presumably only in Japan, for ~$366 (¥30,000).